New Delhi(PTI): The Congress today accused the government of compromising national security following reports claiming that it has scrapped various defence projects including the Rs 32,000-crore minesweeper project. Congress communications incharge Randeep Surjewala said the scrapping of ‘Make in India’Minesweeper Project and the government’s “opaqueness” on INS Arihant are “two glaring examples of this compromise”. “India’s maritime security is compromised by Modi government as Chinese threats loom large. “Scrapping of Rs 32000 crore Minesweepers project for Navy. Who benefits? Shockingly, INS Arihant-India s only Nuclear Submarine has been left crippled since 10 months now! 56 Modiji?,” he tweeted. Surjewala said the government must answer as to who benefits by scrapping a series of defence deals and important projects. He also alleged that the armed forces’ demand for defence capital budget is “drastically reduced”. “False Bravado, chest thumping and TV studio warfare are the tools employed by Modi Government to manage the headlines when it comes to critical issues of national security. “But the reality and actuality of their tall claims are getting unravelled day by day. As the Modi Government completes 43 months in office, it has become increasingly evident that its directionless policies are harming India s strategic interests and compromising national security,” he said. 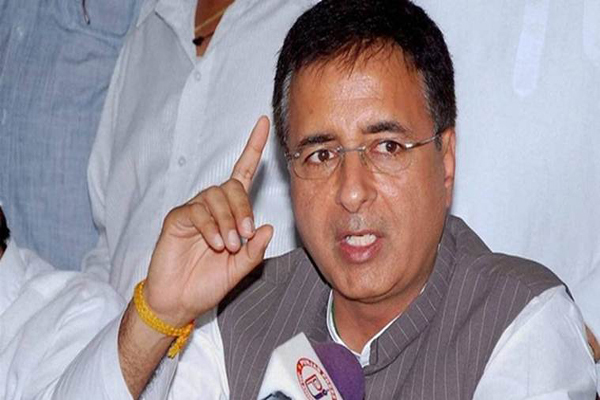 Surjewala alleged that the government has reportedly scrapped the Rs 32,000 crore project to build 12 advanced minesweepers at the Goa Shipyard in collaboration with South Korea, “striking a blow” to both the Navy and its own ‘Make in India’ plans in the defence sector. Advanced minesweepers are specialised warships that detect, track and destroy underwater mines laid by enemy forces. The Congress leader said Indian Navy will have to soldier on for the foreseeable future with a stark capability gap in detecting and countering naval mines, even as Chinese submarines regularly patrol the waters of the Indian Ocean and Arabian Sea and could potentially deploy the said weapons that would prove to be a danger for the country’s sea warriors. He noted that Chinese nuclear and conventional submarines are regularly making forays into Indian Ocean and strategic experts continuously point out the string of pearls which China is attempting in Indian Ocean by leveraging its influence on India s neighbours like Sri Lanka Maldives, Bangladesh by building strategic bases there. “The defence minister should clarify the factual matrix on INS Arihant and when will it start operationalizing again. Shockingly, the absence of Arihant from operations came to Modi Government s attention during the India-China military standoff at Dokalam,” he said.